High-low case adjustment allows a 70" x 70" screen to be fully opened in a room with an 8' ceiling. 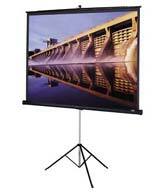 Keystone eliminator tilts the screen forward to compensate for distorted images (standard on all sizes except 84"x84" and 100" diagonal). Matte White, Glass Beaded and Silver Matte fabrics will be seamless in all sizes.